Love this post. I’ve been talking to people about biiig worm farms, and was told of the ‘yogurt trick’… So apparently…you can inspire mass migrations of worms-from one water tank sized farm to it’s matching neighbor by waiting for a rainy night then painting yogurt around the rim of the empty farm. Then hide under a brolly with a torch and get ready to be grossed out by amazingness. Wow – the yoghurt thing sounds like a darn fine party trick – thanks for the heads up! We recently put in a worm tower and I love it (used to have one of the shop-bought layered ones before). In our old farm, most of the worms would die every summer as the farm overheated, even in the shade. Now the worms can go hide in the dirt and stay cool. It’s the best. I need some worms to start a worm tower. Where can I buy them in the Eastern Suburbs of Melbourne, e.g. from Ringwood to Lilydale? Also where can I buy a worm tower from? Great information. Luccky me I recently found your blog by accident (stumbleupon). 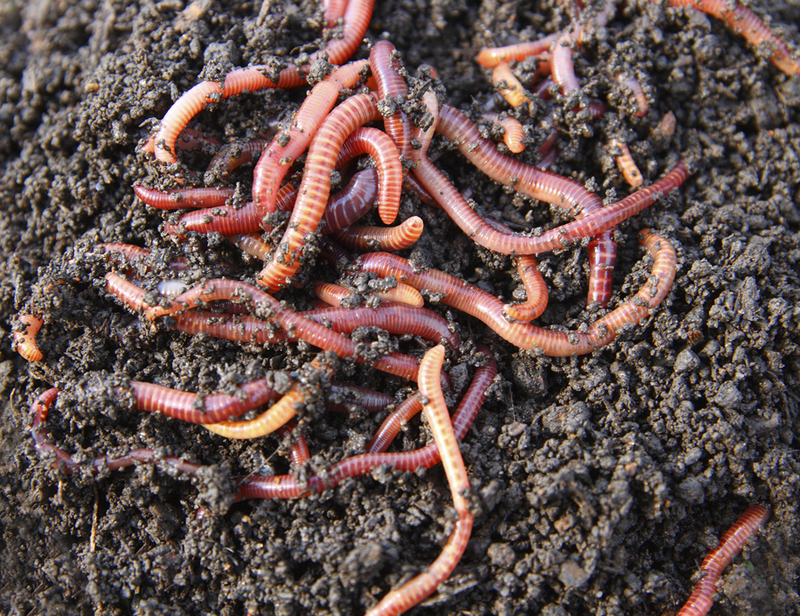 I’m surprised by the claim that our ordinary garden-type earthworms will die in worm farm conditions. 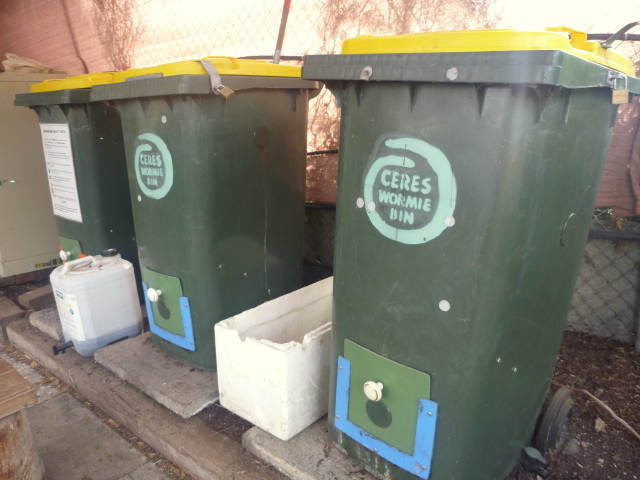 For the last two years we’ve grown veges in fifty ‘elevated’ 100 litre containers, with a ‘drain-pipe’ allowing excess water and nutrients to filter down into fifty buckets below these boxes. We’ve added common, ordinary earthworms to each box, as we’ve found them. To our surprise, most buckets have collected scores of healthy earthworms, which grow to astonishing size in these nutrient flows. Moreover the worms captive in these boxes are all healthy, large and active. 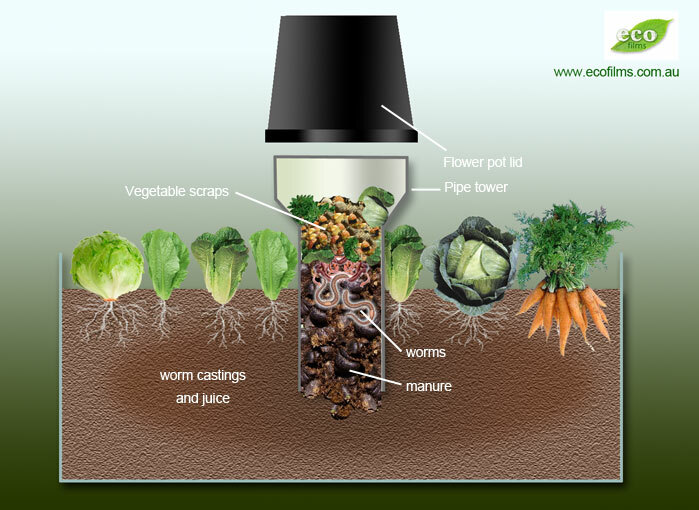 Given our experience, why do earthworms in commercial wormfarms die, when _ours_ are so healthy and large? Very interesting to hear of your experiences – I haven’t got an amazing answer for you, sorry. I can speculate that your system is beautifully balanced, meaning the common earth worms can thrive as well as red wriggler/tiger worms, whereas others might simply be too ‘rich’. All I can say is, if it’s work great for you – keep doing it! Here’s a great link that clarifies the differences of the worms we commonly use and run across… thought I’d share! Usually they’re always together. When you buy them from the ‘shop’ they’re always packaged together and when I take a look into people’s worm farms there are always both. I’m not aware that one is better than the other. Woot, I will cetniarly put this to good use! 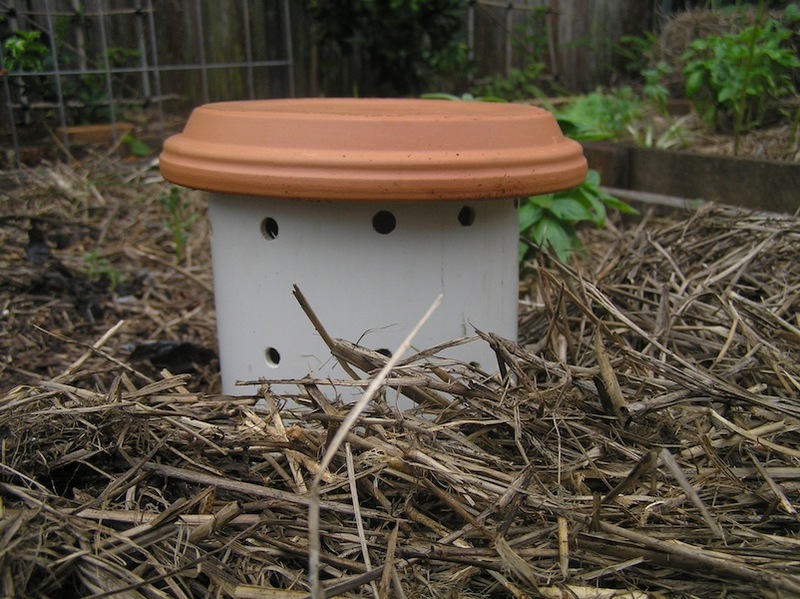 Do you have to place a protective barrier, such as chicken wire, under the worm tower, to prevent pests from invading and eating your worms? If rodents are a problem you can use a bucket instead of a pipe. 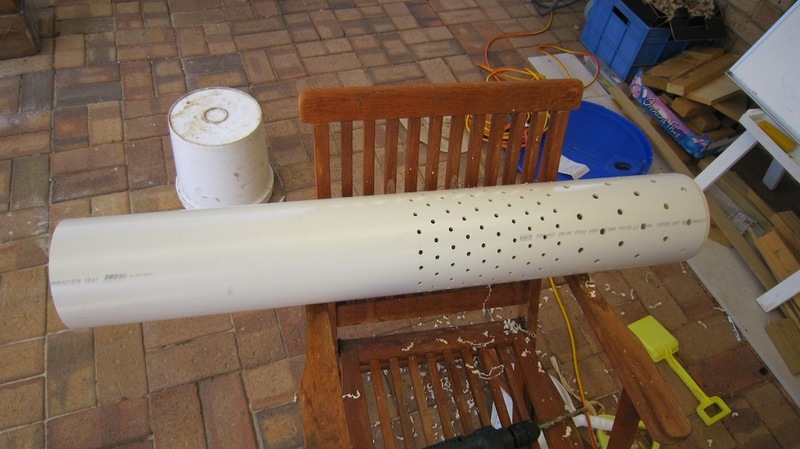 I’ve used a 20 litre bucket that I’ve drilled holes into – the holes are big enough for worms to come and go but not for any rodents. You could of course add some “vermin mesh” to the bottom of the pipe as well to do the same job :-).